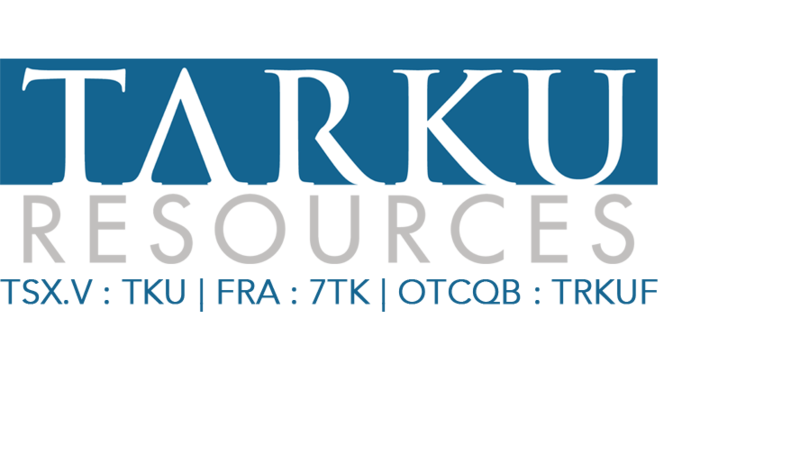 Tarku Resources Ltd. (TSX.V: TKU) (“Tarku”) is pleased to announce that it has reached agreement with Anthem Resources Inc. (TSX.V: AYN) (“Anthem”) whereby Tarku may earn 100% of its Chateau Fort gold property in central Quebec. The road-accessible property is located approximately 70 kilometres south of Stornoway Diamond Corporation’s Renard Mine and adjoins the “167” property currently being drilled by Visible Gold Mines Inc. (TSX.V: VGD). The property is along strike and directly adjacent to the past-producing Eastmain Mine property of Eastmain Resources Inc. (TSX.V: ER), which contains 255,750 ounces of gold and 4.1 million pounds of copper, including measured resources of 91,500 tons grading 0.268 ounces/ton gold and indicated resources of 786,600 tons grading 0.294 ounces/ton (Campbell Resources, 2004 Annual Report, available on SEDAR at www.sedar.ca). These estimates are quoted from the Eastmain Resources website and may not be NI43-101 compliant. A qualified person from Eastmain has not done sufficient work to classify the historical estimates as current mineral resources as defined by NI 43-101. The resource should not be relied upon. Under the terms of the agreement, Tarku may earn a 100% interest in the Property, subject to certain underlying diamond rights and Net Smelter Return royalties. To earn 100%,Tarku will pay $100,000 in cash and issue 8 million shares in staged payments over four years. This includes a $5,000 payment on execution of this letter agreement (paid), a payment of $10,000 and 2 million Tarku shares and completion of a $400,000 financing by April 21, 2015 (subject to regulatory approval). Chateau Fort adjoins the “167” property currently being drilled by Visible Gold Mines Inc. In late 2014, Visible Gold announced the discovery of high-grade Au-Cu-Ag boulders at Km 147 and KM 150 along the newly constructed Route 167 Extension, a 4-season road providing direct access to the region. The property is also along strike and directly adjacent to the past-producing Eastmain Mine of Eastmain’s Ruby Hill project as well as directly south of their Lac Lessard Property. Eastmain plans a work program of $1 million and $500k respectively on those properties which will include an extensive drill program at each (PR- eastmain.com January 27). The Chateau Fort property is 18,867 hectares in size and includes Au, Ag, Cu, Zn and As anomalies from Anthem’s geochemical surveys (lake bottom, soil and stream sediments). Compilation work has identified nine high-priority gold targets for follow-up. Tarku plans a $230,000 airborne EM survey in spring of 2015 and follow-up ground work later in the year in order to identify possible drill targets. semi-massive to massive sulphides”. The rocks have the appearance of banded mafic/felsic volcanics with sulphides and quartz layers, based on photos on the VGD website. It is likely that they are sourced from the NNE, based on the regional ice direction indicators. Tarku Resources Ltd. is an exploration company focused on discovery in the mineral-rich Canadian landscape. The foundation of the company is based on an experienced management team with a track record of success. The goal of Tarku is to provide success for shareholders through the implementation of strategic property acquisition, the use of proven exploration techniques and the exploitation of fertile ground. Management cautions that past results or discoveries on proximate land are not necessarily indicative of the results that may be achieved on the company’s properties. The technical information in this news release has been reviewed by Michael S. Cathro, P.Geo, Anthem's vice-president of exploration and a qualified person as defined by National Instrument 43-101. Cautionary Note Regarding Forward-Looking Statements The information in this press release includes certain "forward-looking statements". All statements, other than statements of historical fact, included herein including, without limitation, plans for and intentions with respect to the company's properties, strategic alternatives, quantity of resources or reserves, timing of permitting, construction and production and other milestones, are forward looking statements. Statements concerning Mineral Reserves and Mineral Resources are also forward-looking statements in that they reflect an assessment, based on certain assumptions, of the mineralization that would be encountered and mining results if the project were developed and mined in the manner described. Forward-looking statements involve various risks and uncertainties. There can be no assurance that such statements will prove to be accurate, and actual results and future events could differ materially from those anticipated in such statements. Important factors that could cause actual results to differ materially from TKU's expectations include the uncertainties involving the need for additional financing to explore and develop properties and availability of financing in the debt and capital markets; uncertainties involved in the interpretation of drilling results and geological testing and the estimation of reserves and resources; the need for cooperation of government agencies and First Nations groups in the exploration, and development of properties; and the need to obtain permits and governmental approval. TKU's forward looking statements reflect the beliefs, opinions and projections of management on the date the statements are made. TKU assumes no obligation to update the forward looking statements if management's beliefs, opinions, projections, or other factors should change.